Public health services in Queensland, including public hospitals, are provided through 16 Health and Hospital Services (HHSs), each of which operates as a statutory body with a governing Hospital and Health Board (HHB). Queensland Health released an e-health Investment Strategy in August 2015, outlining an e-health investment strategy costing $1260,000,000. 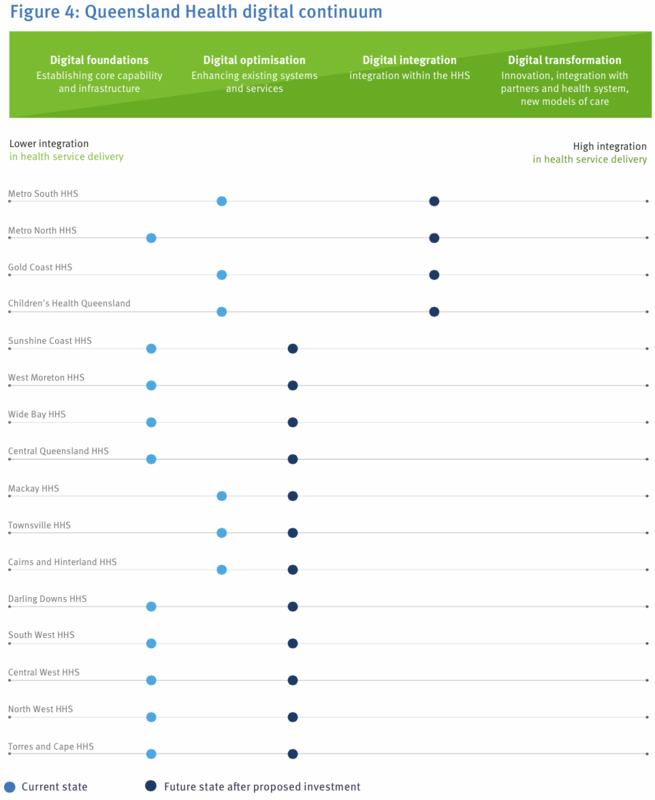 The following table from that Strategy illustrates where each of the Health & Hospital Services expects to be with their e-health capability if and when the $1260,000,000 is spent. eHealth Queensland manages e-health infrastructure including the Clinical Viewer. In 2016, they embarked on a statewide e-referral infrastructure project, primarily to support the State's Specialist Outpatient Strategy. Other e-health initiatives are briefly described here.